"Two ingredients are required for a quality plaster job - quality products and skilled craftsmen." 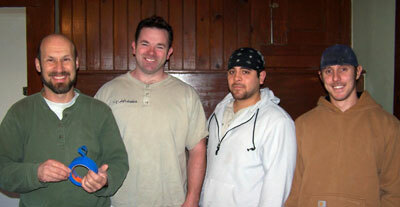 We are a small, family business specializing in quality plaster work since 1988. All our employees are also part owners. Sam Singer and Bart Walsh are the senior partners. Sam has been plastering for more than two decades. Sam's sons Luke and Jack work on the crew, and have been plastering for seven years. 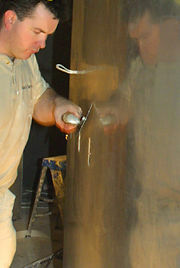 Bart is a third generation master craftsman from Ireland, and has been plastering for most of his adult life. If some carpentry related to the job is needed, we can handle that too. You will find that we are reliable and trustworthy. In the rare instances where there are problems (e.g., a crack develops), we will make it a priority to come out and fix it. We are committed to continual improvement, and are constantly refining our processes. We use the best quality, job-proven materials and pay attention to detail. We don't take short cuts. Whether it's the inside of a closet or the entrance to a museum, we complete every job to the highest of standards. 2008 CT ABC Excellence in Construction Award: 1st Place for Historic Renovation for the Florence Griswold Museum Restoration project. Presented to Knoneberger & Sons Restoration Inc. Team member Avalanche Plastering LLC. "A man who works with his hands is a Laborer. A man who works with his hands and his head is a Craftsman. A man who works with his hands, his head, and his heart is an Artist." - from Plastering Skills, by Van Den Branden/Hartsell.